Throughout February, Jamestown Settlement and the American Revolution Museum at Yorktown will present “African-American Cultural Heritage Month,” featuring a variety of programs that reflect and honor the significant contributions and achievements of African Americans in our nation’s history. This year marks the 400th anniversary of the first recorded Africans to English North America, one of several key historical events held in conjunction with 2019 Commemoration, American Evolution. Through monthlong activities and educational demonstrations at Jamestown Settlement, visitors can compare the culture of the first Africans, who were Angolan, with that of the English and Powhatan Indians they encountered in Virginia in 1619. At the American Revolution Museum at Yorktown, daily programs, periodic lectures and classroom presentations will explore the role and impact of African Americans on both sides of the war. 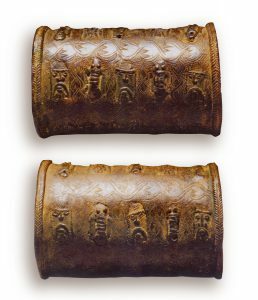 Benin copper alloy bracelets, circa 17th-19th century. Jamestown-Yorktown Foundation collection. Museum educational programs will allow visitors to learn about the culture, society and technology of west central Africa, the first recorded arrival of Africans to Virginia in 1619, and stories of Africans in Virginia and their shift in status as laws changed, developing into the institution of slavery. Hands-on educational programs in exhibit galleries feature reproduction African objects, images and documents, exploring aspects of African tools, weaponry, transportation, housing, clothing and ornamentation. Programs will take place on February 2-3, February 9-10 and February 16-March 2, 10 a.m. to 12 p.m. and 12:30 to 2:30 p.m.
Jamestown Settlement’s permanent exhibition galleries feature one of the most varied collections of objects relating to the nation’s beginnings in 17th-century Virginia, including more than 500 objects representative of the Powhatan Indian, European and African cultures. The skill of west African craftsmen as well as African contact with Europeans is reflected in a pair of bronze bracelets from Benin whose decorations include stylized pictures of Portuguese soldiers, and an Owo carved ivory bracelet, an example of an object highly valued by European collectors. A dramatic multimedia presentation, “From Africa to Virginia,” chronicles African encounters with Europeans, the impact on African culture, and the development of the transatlantic slave trade. Visitors can examine a reproduction of a coat worn by African-American soldiers in the British 33rd Regiment of Foot. From the first shots fired at the Boston Massacre to the final victory at Yorktown and points in between, classroom presentations and lectures will explore the contributions of both well-known and little-known participants in the Revolutionary War. At the Continental Army encampment, accessible on guided tours through mid-February, historical interpreters discuss the roles of African Americans in the Revolutionary War and the 1775 proclamation by Lord Dunmore, promising freedom to people enslaved by rebellious colonists, if they came to the British side. 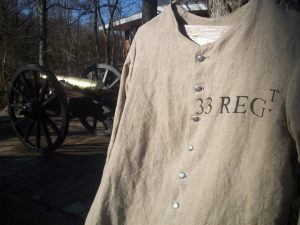 Visitors are invited to examine and try on representations of a coat worn by formerly enslaved people who joined the British 33rd Regiment of Foot and a hat from the American army’s 1st Rhode Island Regiment, which for a time during the Revolution included several companies of African-American soldiers. The personal stories and roles of African Americans during the war is further explored during a “Forgotten Soldier” special exhibition starting June 29. On the re-created Revolution-era farm, visitors can glimpse of the lives and roles of enslaved people on a small farm and African influence on American foodways. Among the iconic artifacts of the Revolution on exhibit is a circa 1733 portrait of Ayuba Suleiman Diallo, one of the two earliest known portraits done from life of an African who had been enslaved in the 13 British colonies that became the United States of America. Also on display is a first edition of the Phillis Wheatley 1773 volume, “Poems on Various Subjects, Religious and Moral,” the first book to be published by an African American. Visitors can learn about diverse Americans – Patriots and Loyalists, women, and enslaved and free African Americans, including Benjamin Banneker, a free African American who became famous in the 1790s as a scientist and writer. An interactive exhibit shares accounts of Billy Flora and James Lafayette, an enslaved African American from New Kent County, Va., who successfully spied on the British for the American forces. Shown every 30 minutes in the museum theater, “Liberty Fever” features the stories of five people who lived during the American Revolution, including Billy Flora, an African-American hero of the Battle of Great Bridge in 1775. Jamestown Settlement and the American Revolution Museum at Yorktown, open 9 a.m. to 5 p.m. daily year-round, are separated by a 25-minute drive along the Colonial Parkway, a National Scenic Byway. During January 2–February 15, outdoor interpretive areas are accessible to visitors through scheduled guided tours. Jamestown Settlement is located on Route 31 just southwest of Williamsburg. The American Revolution Museum at Yorktown is located on Route 1020 in Yorktown. Parking is free. A value-priced combination ticket to both museums is $26.00 for adults and $12.50 for ages 6-12. Admission to Jamestown Settlement is $17.50 for adults and $8.25 for ages 6-12 and, to the American Revolution Museum at Yorktown, $15.00 for adults and $7.50 for ages 6-12. Children under 6 are admitted free. Residents of James City County, York County and the City of Williamsburg, including College of William and Mary students, receive complimentary admission with proof of residency. Joint tickets with other Williamsburg attractions also are available. For more information, call (888) 593-4682 toll-free or (757) 253-4838.